The teams of students representing the Yeshivah of Flatbush recently won highest honors in this year’s WordWright Challenge, a national competition for high school students requiring close reading and analysis of many different kinds of prose and poetry. Participating with 582 school teams from all across the country, the school’s ninth grades placed third in the nation in the year’s second meet, held in December. At the same time, the school’s tenth grades placed fifth in the nation, and its eleventh graders placed second in the nation. Students at the school who achieved outstanding results in the meet included freshman Albert Dweck, who was one of only two ninth graders in the entire country to earn a perfect score, sophomore Joyce Nassar, who was one of only six tenth graders to do the same, and junior Andrew Hersh, who was one of only fifteen perfect scorers at the eleventh grade level. Near-perfect scorers were freshmen Dylan Sutton, Carol Sabbagh, and Victoria Gindi; sophomore Abie Tawil; juniors Shira Cygler, Ely Kattan, Joey Dweck, and Michael Tawil; and seniors Adam Herkovitz and Daniel Schuster. Freshmen Joseph Balassiano, Lea Linfield, and Albert Rahmey all earned honorable mention. More than 58,000 students from across the country (and from four foreign nations) participated in the meet. 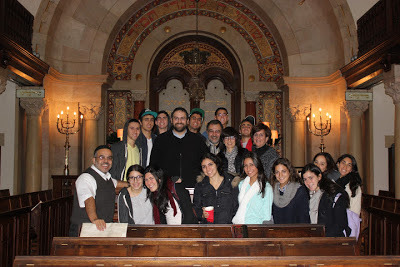 All students were supervised by Shifra Hanon. Shavua Tov! This post is a little delayed, and the jet lag is beginning to wear off, thank goodness. On Wednesday, after Shaharit and another great Israeli breakfast at the Dan Panorama in Haifa, the last day of our trip began with a workshop with Venture Capitalist - Jacob Ner-David, the Managing Partner of Jerusalem Capital 1. Mr. Ner-David explored some of the ideas that the students had, and gave pointers about how to go about bringing an idea for a start-up to fruition. It was a valuable experience and he was happy to share his email contact with our group so that they could stay in touch and continue to benefit from his advice. 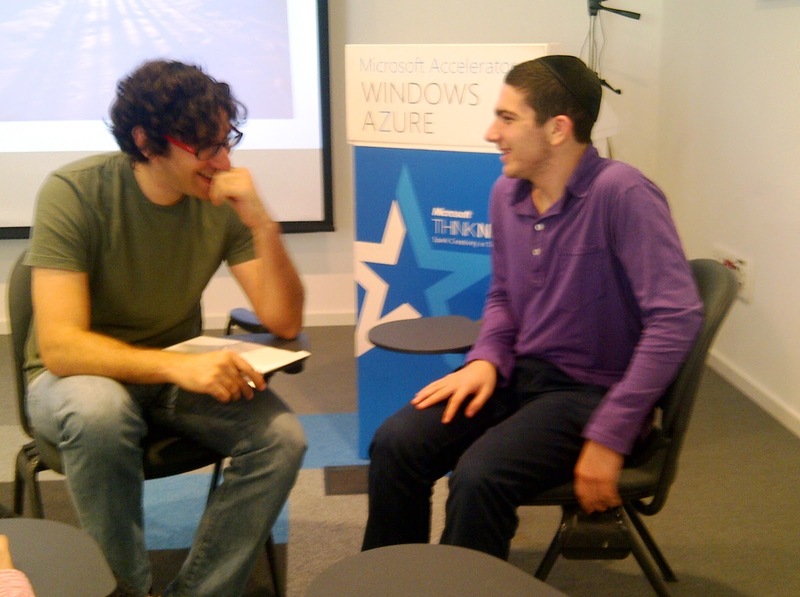 We were then on our way to Tel Aviv, to meet with Shai Tsur, the Business Development Manager at Microsoft. 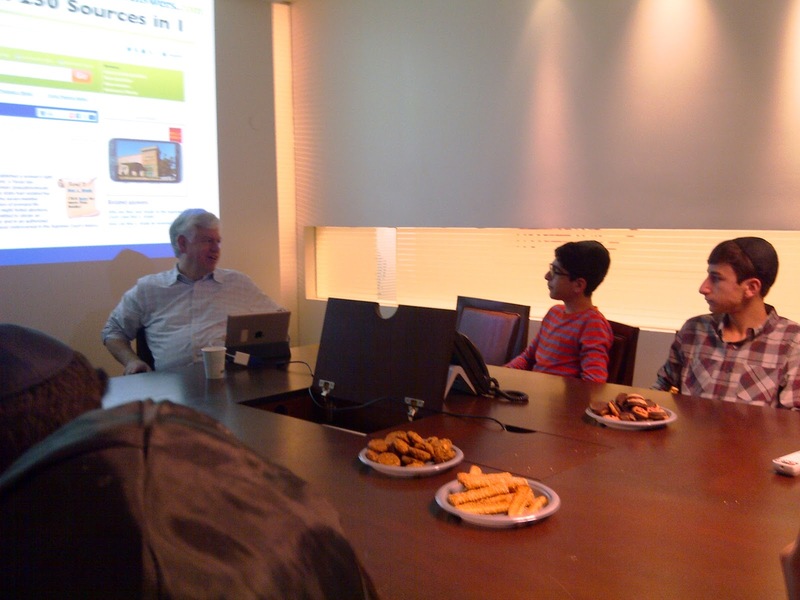 At Microsoft, we learned about the Microsoft Accelerator for Windows Azure. This program is a unique project where Microsoft provides workspace, mentors, business tools and access to government grants to groups looking to start-up a business. We met with two groups who interviewed us in order to refine their apps to make it appealing to the market. We gained an insiders view of the process of marketing a new app, and they gained from the ideas and viewpoints of our group. An amusing side point - we got there for lunch, and were told that we can use the game room. We all figured, game room at Microsoft - it must be loaded with X-boxes and other computer games. Well, we couldn't have been more wrong! It was completely "low-tech" with an air-hockey table, a pool table, a pinball machine, and one racing computer game. That was a surprise! But when we thought about it, we realized that the people at Microsoft would probably not want to play computer games on their lunch break! We left Microsoft late in the afternoon and made our way to the old city of Yaffo to explore the shops until it was time to leave for our farewell dinner at the Maganda Middle Eastern Grill in the Yemenite Quarter in Tel Aviv. During our dinner we went around the table with each one of saying what part of the trip moved us most. For some it was the people we met, for others the inventions we explored. 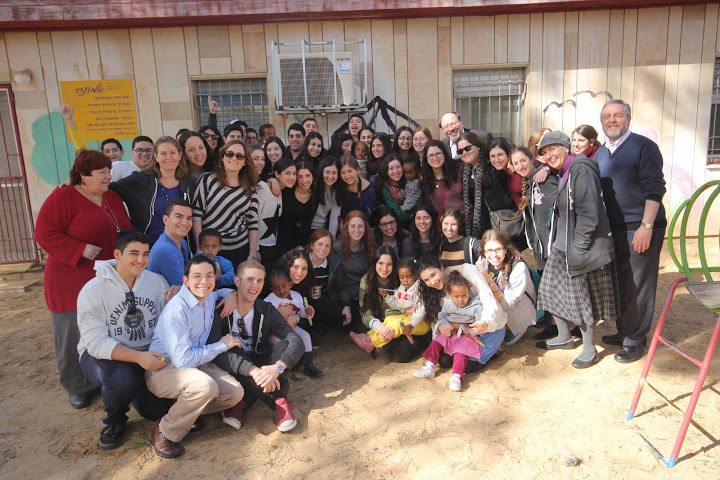 Everyone was touched by our experiences with the Chesed Mission and was grateful to have had the opportunity to join them at the army bases. Sammy Tebeile challenged each of us to take this feeling of inspiration and to act on it quickly, pointing out that we are not only the leaders of tomorrow, we are in fact the leaders of today!Muki, our tour guide, pointed out that we are among perhaps only 100 or so people in the world who have had this experience and it would be important to express gratitude to everyone who helped to make the dream a reality. I know that each of the students who joined in the trip will cherish the experience and will draw strength and ideas as they plan their futures. It will surely help them as they work towards their goals of becoming engineers, businessmen, scientists and the leaders of tomorrow. Today was the final day of #TheMission. Many of us woke up extra early to pray at the Kotel. We checked out of the hotel in the morning and enjoyed our last amazing and filling Inbal breakfast. Our first stop was to Yad Lakashish in Jerusalem. Yad Lakashish is a workplace for the elderly who need money to support themselves and their families. Most of elderly people who work there are immigrants. The organization didn’t want to just give these people money, but decided to give them a job so that they could support themselves and take pride in what they do. We saw how they make hand made items in ceramic, metal, cloth and more, which we then bought in their gift shop. We then went back on the bus to our last army base to dance and sing with Israeli soldiers. We also gave them gifts such as sunglasses, thermals, and socks. They were so happy to see us and hang out with us. I really think we made a huge difference in their lives because they know how much we care for them and really thank them for what they are doing. We also had the opportunity to tour their bunks and play area. We said goodbye to the soldiers and went on to our final stop. We started the day by visiting Ichilov Hospital. We walked around the hospital giving out gifts and meeting many children and teens that are struggling with cancer or recovering from surgeries. When we walked in to give a child a gift their parents were thankful and amazed at how we were spending our vacation. After covering 3 floors of the hospital with blankets, dolls, and toys, we then went to a Tel Aviv mall for lunch. It was packed with people because it was Election Day israel. Elections in Israel are very different than in America, as Rabbi Levy and Daniel our tour guide explained to us. Everyone gets the day off of school and work. After we ate lunch and shopped for a bit we loaded the buses to go Go-Karting with injured soldiers from a project called Tikvot. Tikvot is an organization that finds injured soldiers and encourages them to believe that they can still live fulfilling lives. Tikvot encourages soldiers to participate in various sports in order to feel that they could accomplish many things. While half of us went go-karting, the other half listened to the stories of the injured soldiers and people wounded in terrorist attacks. We then switched so we were able to experience both amazing opportunities. Their stories truly inspired us and showed us how even though they were injured they do not regret fighting for their country and if they could, they would do it again. We started our day at Aleh, a home for children who are severely disabled. It was a challenge for most of us, but ultimately it was very rewarding. 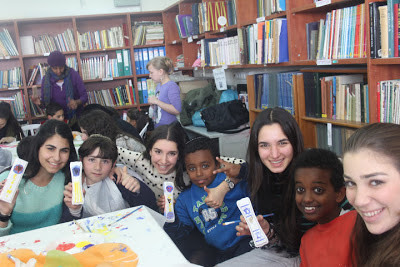 Some of us helped prepare food and some of us worked on Tu B'Shvat projects with the children. Others helped with therapies and gardening. We enjoyed watching a video of Aleh's children performing a flash mob. Aleh's attention for every child's quality of life is unique. We were fortunate enough to also get to know the staff who love and care for the children as if they were their own. They provide love and care in addition to medical attention and are true ba'alei chesed. Next we went to Tel Hashomer hospital to visit the pediatric ward. We gave out a variety of toys to children in hematology and oncology as well as in the other areas. While at Tel Hashomer we met with an injured soldier named Zeev. He was injured in the operation Pillar of Defense two months ago. He told us his story about how he lost one arm and how his other arm was paralyzed. He was very inspirational, explaining to us that his ultimate goal is to rejoin the army to defend our homeland. he also reinforced the idea of ahavat achim that should be instilled within all of us when he said, "I love you all." Later we went to Israel's children museum where we heightened our sensitivities to different types of people. Some of us experienced 'Dialogue in the Dark' and some of us experienced 'Dialogue with Time.' Dialogue in the Dark is an exhibit that helps people understand what it means to be blind. Dialogue with Time helped us understand the challenges and meaning of growing old. These exhibits enriched the chesed we did - be it dancing with children at Keren Or or serving food to the elderly at Carmei Ha'ir . Our last stop was Bayit Cham for the girls and Yeshivat Torat Shraga for the boys where they met with alumnus Elliot Dweck who is studying there for the year. The girls enjoyed dancing and hanging out with the girls of Bayit Cham who have turned their lives around. We are now in Haifa, which many consider the technology capital of Israel. We've met with so many different people and visited so many places, that it's hard to recount everything here, but I'll try. We left the Inbal and our Chesed Mission friends yesterday morning and boarded the bus for our first stop - G-Nius Industries. This is the company that programs and produces the unmanned vehicles that help protect the soldiers and, in turn, the people of Israel. We were fortunate to have Mark and Rena Goldstein along for the morning who shared our fascination for this most critical of industries. We watched videos that showed what the vehicles can do, which even includes the ability to demand an unknown intruder to show his ID to the camera for verification. We then were shown the actual vehicles but because of security, were not allowed to take photographs. You can check out a You-tube here http://www.youtube.com/watch?v=Bhvy1ZgcWB4. After G-nius, we went to visit MiLab - media invention labs. This is located in IDC college in Herzliya. Our guide (a graduate student), explained the main types of inventions that have been produced - mostly apps based on human needs, or robots that respond to human emotion. We ended the day at the Technion Institute where we learned about the two most recent nobel prize winning discoveries - Ubiquitin - a protein found in all cells, and the most recent award in chemistry for the discovery of "quasicrystals." Because of the upcoming elections (and vacation day) we did not have the opportunity to visit labs, but still came away with an appreciation of the importance of this excellent school. Many of us asked to be included on their email list so we can keep up with the important activities taking place there. 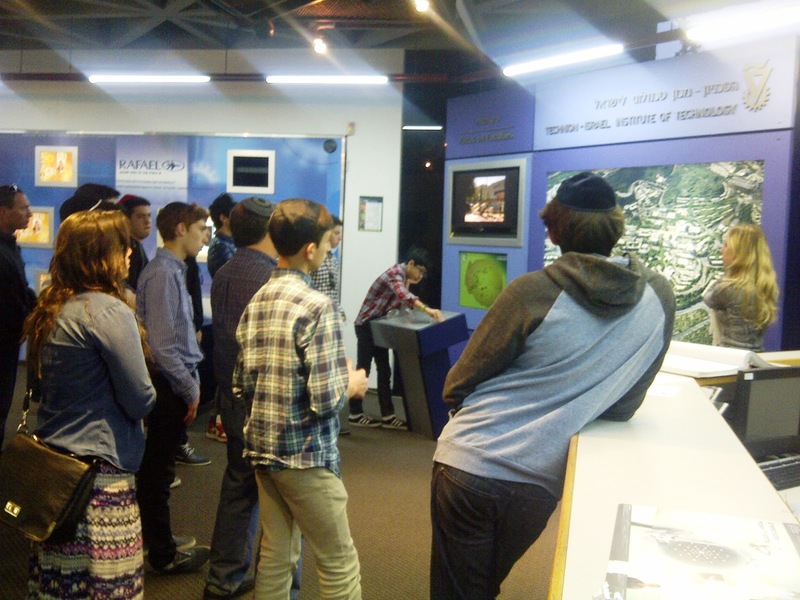 Students also were interested in opportunities to intern or study at the Technion after high school, or even after college. Day 7 (I can't believe we're coming to the end of our trip!) was Election Day in Israel. Schools and businesses were closed, but there was still lots to take in and do. We started at the ancient and historic city of Akko, touring some of the tunnels, and hearing about the British prison there. It was another beautiful day, and we ate our lunch on the plaza overlooking the Meditteranian Sea. Our next stop was to visit Steve Rhodes, the CEO of the start-up incubator company Trendlines in Misgav. They specialize in biotech and green technology industries and hear 450 potential start-up ideas a year. Of these, they fund around 7-8 per year and are now 50% owners of around 60 new companies, all in various stages of production. It was exciting to hear about and see the inventions Trendlines has funded. We were also impressed by their business model, which I'm sure that any of our students will be happy to share with you when we get back to school. From there we went "Jeeping" in the Galilee near Carmiel, going up and down the hilly terrain there. We stopped for a short climb to a lovely waterfall and to admire the beautiful country that is Israel. We ended our day with our guide Muki explaining the Israeli political system, the major parties and players, and finally what the results might mean. So, we're off to bed - knowing that tomorrow will be the last day of this truly wonderful experience in Israel. We are grateful to be a part of the Yeshivah of Flatbush and know that it is because of the enthusiastic support of its administration and parents that this dream trip has become a reality. What a great way to start off a new week here on Chesed Mission! We had a fun, action packed, chesed filled day. Our first stop was to Keren Or. Keren Or is an organization and school for children with disabilities and who are visually impaired. When we first walked in, it was very hard because we were definitely not in our comfort zone. We didn't really understand the situation that was going on. After 5 minutes, we were all able to get involved and we started dancing with all the children. All though many of the children couldn't see or hear us, they still knew we were there. It was truly an inspiring visit. Once the children went back to class, they took us to see their pool where they recieve hydrotherapy. It was beautiful. We were then off to our next stop. We headed to Kever Shmuel. At the kever, our tour guide Daniel gave us a biblical lesson about King David and Shmuel Hanavi and their charachter traits. The view was beyond beautiful which gave us an awesome photo-op. Many of us went to pray next to the kever and the girls finished the whole book of tehilim while praying by the tomb. We then got back on the bus and headed to a small mall to stop for a quick lunch. Our next stop was to Afikim, which is an after-school program for children that come from troubled homes. We sat with the children and interacted with them. We were given an arts and crafts project and made mezuzot. The children were adorable. We handed out backpacks at the end, took a group picture, and went back on to the bus. On the way back to the hotel, we heard about our next event. The girls had a bat mitzvah program with girls from Sderot while the boys prayed mincha and packed bags for the rest of our trip. The bat mitzvah program was so much fun and inspirational! We sang and danced with the 20 girls from Sderot who were celebrating their bat mitzvah. It cheered up their day and they enjoyed it. 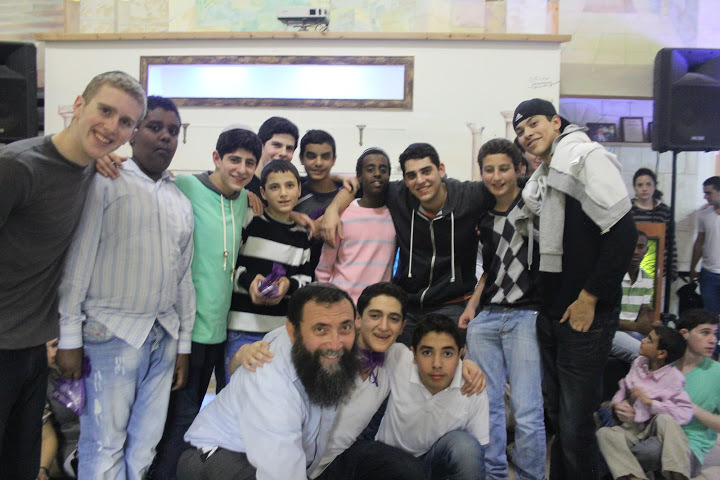 After the boys came up, the bat mitzvah girls left we were given the opportunity to meet teenagers from Sderot. We interacted with them and spoke about how their lives function daily with the dangers around them. As night fell, we headed toward our second army base visit. We went to thank them for protecting our homeland. 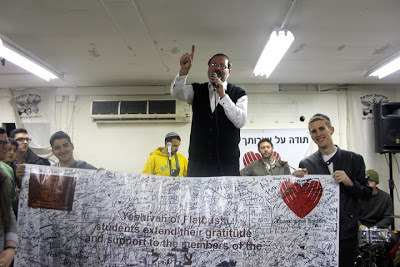 We sang tefilot at the base and handed out much needed supplies such as warm hats, scarves, and gloves. The soldiers were so thankful for what we gave them and they were smiling from ear to ear. After a great evening at the IDF Army base, and another great breakfast at the Inbal, we went to Mobileye, the inventors and producers of accident prevention car camera systems. It is incredible to note that almost all camera sensing equipment is designed and manufactured by this Israeli company and then sold to GM, Honda, Ford, Toyota and other major car companies. We spoke about future developments, and not everyone in the room was so thrilled to hear that soon their parents could have the technology to get notifications about how many times their car is "stopping short." But seriously, we were amazed at the ingenuity of the Mobileye programmers and inventors. Then we had a chance to try it out in their simulator, well look at the photos and you'll see how much fun this was. We were then off to meet with Bob Rosenschein - the inventor and developer of Dagesh for Windows and Answers.com. He shared the story of his journey and the life lessons he learned. It is impossible to describe his sincerity and heartfelt advice here, but it is sufficient to say that when it was over, our students crowded around and asked questions for quite a while until we had to leave. Next up was the Israel Museum - where our guide, Muki, explained the relationship between the ancient city of Yerushalayim and the Yerushalayim of today, the history of the dead sea scrolls and the significance of the archeaological finds that were on display. 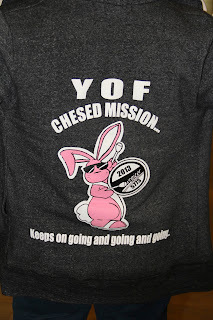 We ended the day with another inspiring visit to another IDF base near Modiin with the Chesed Mission. Shavua Tov! Sorry for not getting back so soon - it's been 3 incredible days since I've had a chance to write. Friday morning, we checked out of the Tal Hotel, bid farewell to Tel Aviv, and made our way up to Yerushalayim. The main event of the day was a guided tour, with Muki Zohar, our excellent guide and new friend, through the ancient Ir David (City of David). He seamlessly wove archeology and history with Tanach. It reminded us of the powerful Israel experience of walking in the footsteps of our ancestors through the ages. We ended the visit with a tour through a newly opened tunnel that led directly to the northern part of the Kotel. We stopped for a moment and were reminded of the story from the Talmud when Rabbi Akiva explained his laughing at seeing a fox in the place where the Beit Hamikdash was destroyed. And 2000 years later, in an imperfect world, students from the Yeshivah of Flatbush were standing and learning Torah on that very spot. We made our way to the Kotel and then on to Mahane Yehudah for treats for Shabbat! What a scene that was - the most crowded I've ever experienced! Yet everyone met with success and were well-stocked with Shabbat sweets. 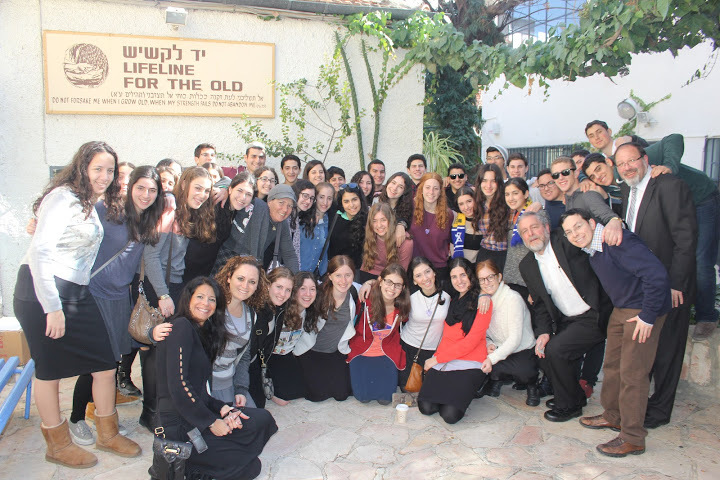 Then on to the Inbal, to check in, prepare for Shabbat and meet up with the Chesed Mission. We experienced the holiness of Shabbat with our friends from YOF and then shared with them the incredibly moving experience of going to an Army Base to say "todah" to the Israeli soldiers. There was singing, dancing, hugging and the presentation of gifts. Thank you Rabbi Besser and Susan Franco for inviting us to be a part of this powerfully emotional evening. We woke up on Shabbat morning and made our way to Shul to celebrate with the Bar Mitzvahs of a few of our Flatbush families. We then had a nice full breakfast and some time to relax and enjoy the beautiful weather outside the hotel. At Shabbat lunch, many alumni and teachers came to join our trip including Noam Wallach and Tamir Jacobi, two Flatbush graduates who are currently serving in the Israeli army. We had a beautiful and meaningful set of singing and Divrei Torah that inspired and solidified the feelings that we’ve been experiencing this past week. We had some time to relax and made our way down for a hotel-wide Havdalah. It’s only the second day in Israel and we feel like we’ve been here for weeks! Erev Shabbat added excitement to the air as we began our day with a very special Shabbat Party with our adorable friends at the Emunah Ethiopian Daycare Center. After we were treated to special songs and dance to welcome Shabbat, we had fun outdoors interacting with the children. We blew bubbles and threw around balls with them, which brought smiles to their faces. Although it was hard to say goodbye, we sent our best wishes and left the children with awesome new toys. We had the most amazing day! After Shaharit and breakfast, we boarded the bus to visit Dr. Ed Mlavsky, one of Israel's first venture capitalists. He explained the whole process of start-ups, the concept of helping Israeli inventors to connect with American funding to help start many new companies. It was amazing to note just how many technologies were invented by Israelis - including flash drives, firewalls, the Pillcam and, most exciting for our students, PrimeSense. Our next stop was an Outdoor Training Exercise. Working with 6 Israeli students, each of whom has been assigned to an elite unit in the IDF, our group completed many tasks to promote team building, leadership and endurance. We ate lunch there and then were off to PrimeSense - to get a first hand look at the new Kinekt technology. What a fantastic story of the conception to reality of this technology, with the drama of presentation to Bill Gates, to the reality of seeing Microsoft buy out their competitors, our students could not get enough of being with him and questioned him until he begged them to let him go to his next meeting, FYI - you will be getting rid of your remotes, and waving your hand to watch TV, movies, play games and connect to the internet. It was a truly awesome to get this first-hand look and to be able to try out their prowess at full-body Fruit Ninja! Look for the invention later this year. It was on to the Olympic Experience from there, where we were able to test our reflexes, strength and concentration in a variety of hi-tech ways. Especially moving was the history of Israeli Olympiads, which is full of triumph and unfortunately the tragedy of the murder of the athletes in Munich in 1972. After dinner, Yossi Taguri, professional App designer, explained to the students with much humor about how mistakes can help you eventually succeed. He demonstrated is App , Pah - a voice activate game for the iPhone, and let us in on a new app that can bring unlimited phone and data service to customers for $10/month. We are looking forward to our Friday trip to the Kotel, the Old City and Ir David, buying Shabbat Treats at Machane Yehuda and to meeting up with the Chessed mission for Shabbat at the Inbal in Jerusalem. This morning we woke up in Israel for the first time on Chesed Mission. We woke up for minyan followed by the amazing Inbal Hotel breakfast. Everyone enjoyed the fresh omelets and waffles before our first very long day of chesed! Our first stop was to Illanot School for disabled children ranging from ages 8-12. Illanot has an amazing staff who help the children with different types of therapy including art, speech, animal, sports and many more. We had the opportunity to dance, sing, and interact with the children. We made them feel so happy. Some of us even played basketball with the boys. The school’s choir put on a very special performance for us. It was so beautiful to watch the smiles on their faces as they sang. Our next stop was to Karmei Ha'ir Soup Kitchen. This kitchen was originally set up as a free restaurant for those who were needy, but it soon was expanded to much more. Now, Karmei Ha'ir also sends clothing and other necessities to those in need. The students of the mission split up into 2 groups, the first cut eggplant and cabbage while the other helped move boxes of fruits and vegetables. After helping and learning in the soup kitchen, we all went to the Hadassah Mall to eat lunch. The mall is on the first two floors of the Hadassah Hospital. We then went up to the 3rd, 4th, and 5th floors to give out presents and toys to all of the children in the hospital. We spoke to the children and their parents and prayed tehillim for their child. It was truly amazing to see how we made these children smile just by giving them a toy car or a stuffed animal. After the hospital, we went to Shalva, which is an organization that helps take care of disabled children after their school day. We went to their playroom and had a fun DANCE PARTY! We sang and danced with the children and had a blast! After saying goodbye and goodnight to the children we met Yossi. 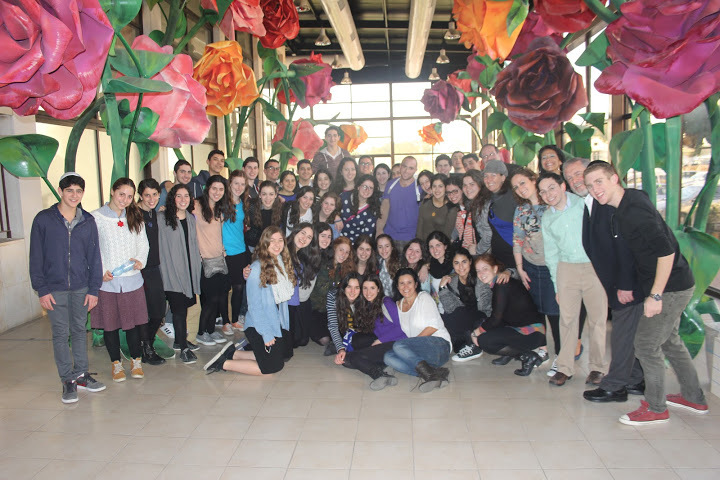 Yossi was the inspiration and reason for the start of Shalva. When he was 11 months old he was given a faulty vaccination making him deaf and blind. His parents searched and searched for years to find him a teacher to help him. They prayed to Hashem that if they find someone to help them they would repay this kindness. They pledged that they would do everything in their power to help parents who go through similar struggles as them by giving the parents a break from the hard life of having a child with a disability. The children love coming to Shalva, because there are so many things for them to do there. Yossi's teacher was able to communicate with Yossi by teaching him Hebrew sign language, known as the "Helen Keller Miracle." 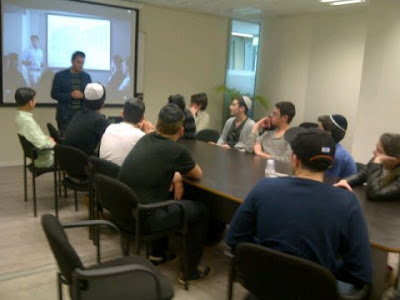 After meeting Yossi we learned how knowledgeable he is in areas such as cars, politics, and the economy. It's been an exhausting day and a half, but we made it! We are at the Tal Hotel in Tel Aviv, where we just completed our first Entrepreneurial Workshop with Steve Gray. Steve is a former VC for Intel in Israel, where his job was to review start-ups for Intel. He spoke to the students about the powerful role that Israel plays in the world of technology and start-ups. It's all about Chutzpah, risk taking and brains. In spite of the long day, and jet-lag, we were riveted by Steve's ideas and look forward to a week of exploring and learning how to become a part of the entrepreneurial world. Tomorrow we will take part in an Out-Door Training program in order to understand the Army's role in team building and leadership training. We continue to PrimeSense - developers of Kinekt for X-Box and round off our travels with a high tech visit to the Olympic Experience. Stay tuned for other updates of our amazing trip! Good Luck, You Got This! We all know how frustrating and stressful finals can be. We hope that giving the students a piece of candy every day would help lighten up the finals tension. 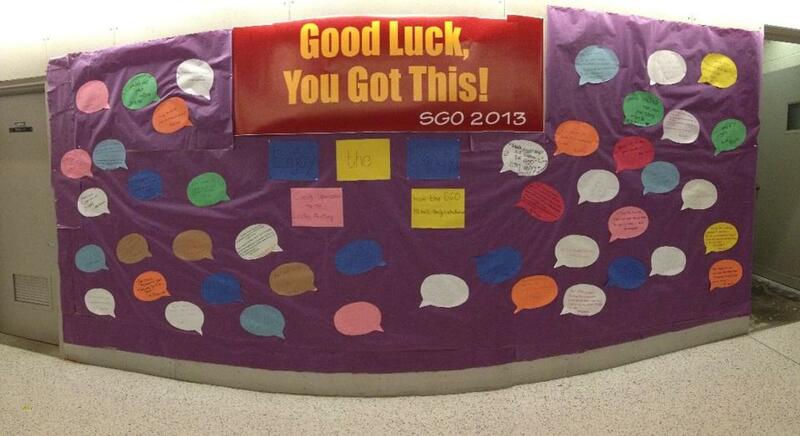 The SGO wanted to show you how our teachers want to encourage you, and wish you good luck on all of our exams. Take a minute to look at the encouraging words said by our faculty on the bulletin board outside of the auditorium. We hope you all enjoy the candy, donated by the Ladies Auxiliary, and we want to wish you success on all your exams!